Allsop's newest accessory is the Headset Hangout - a stylish and functional way of storing and protecting your headphones and tablet, while keeping them readily accessible. 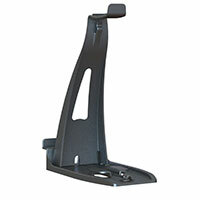 The stand is designed to hold all styles of headphones/headsets including mics, up to a maximum headphone height of 8". In addition to headphone storage, it can also hold your tablet or phone at hour different viewing angles. With a built in cable management system, keep you workspace organized and free of clutter.